List of fishes: Gasteropelecus sternicla, Pyrrhulina cf. 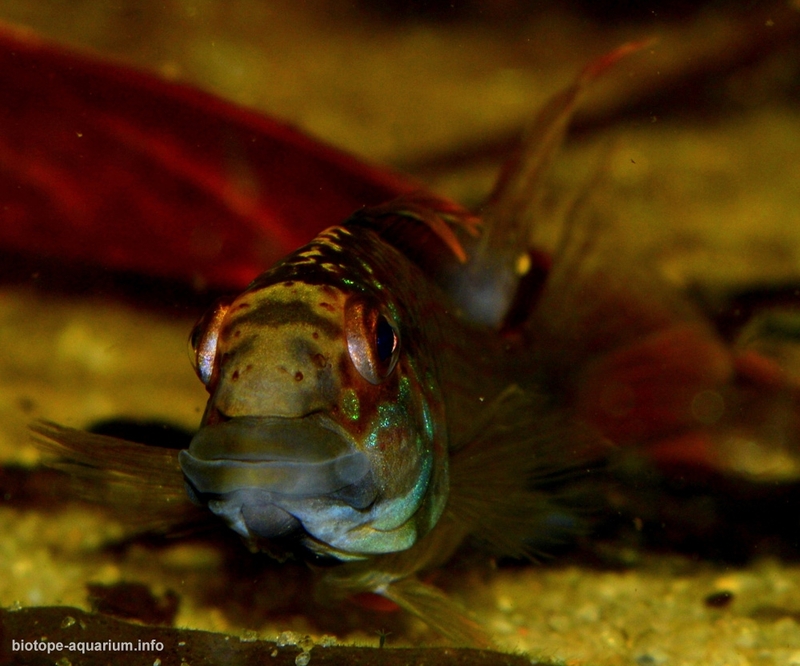 brevis, Hyphessobrycon bentosi, Pterophyllum scalare, Apistogramma barlowi, Otocinclus macrospilus, Tatia intermedia, Macrobrachium sp. This species composition was conceived in such a way to reflect the main ecological niches among the hydrobionts in this river (with the exception of large predators). 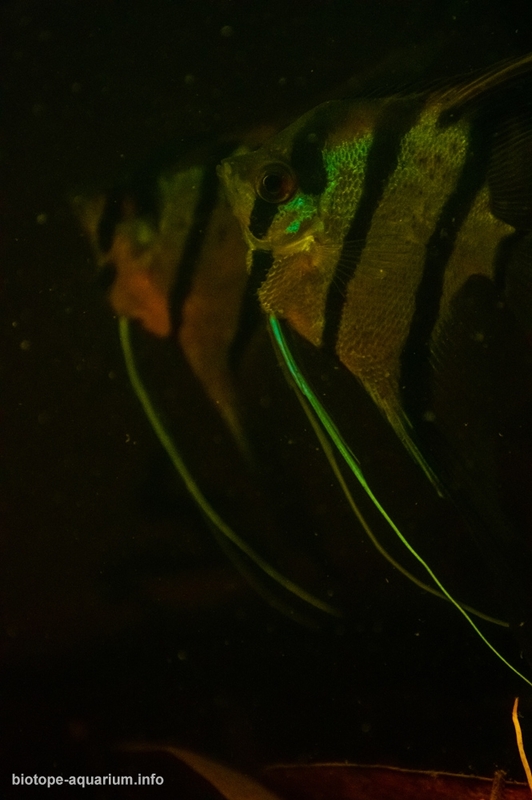 There are the species from different levels of water, with different types of feeding habits and with day and night activity in my aquarium. 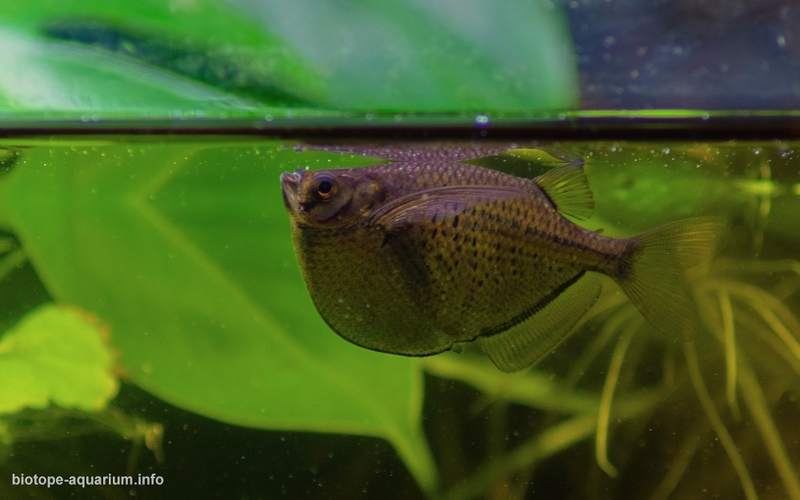 attached to the back side of aquarium, their substrate is clay mixed with peat and coconut substrate. Description of equipment: The filtration was performed by AquaEl Turbo Filter 1500. In addition, riparian plants and “flowing meadow” of water-surface plants (which I normally maintain even in larger amounts than shown here) provide phytofiltration, giving the system stability even with significant amounts of plant debris on the bottom. AquaEl FZN3 filter was used to enhance water flow in the “rain season” part of video. Biodesign LED lighter (17,5W, 6500K) and 100W heater are used as well. Water parameters: The temperature is 24-26°C, conductivity is about 40 ppm, pH is about 5.5. 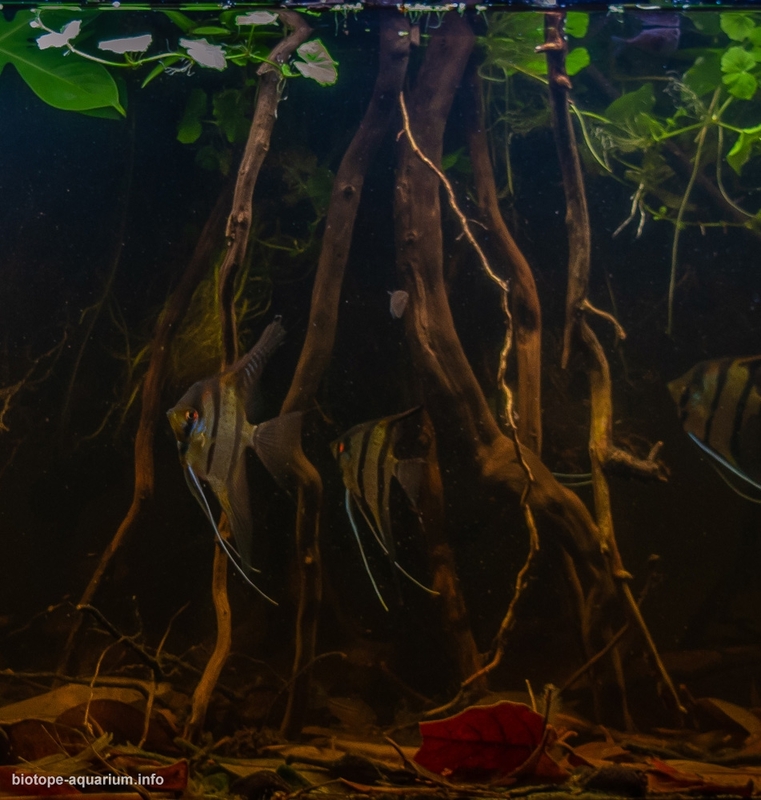 Description of the area surrounding the biotope: Rio Ampiyacu is a left tributary of the Amazon river and flows through the lowland rain forests in northeast Peru, between Iquitos and the border with Colombia and Brazil. Because of the small difference in altitude between the upper and lower reaches of this river (about 50 m), the surrounding area is quite similar throughout all Ampiyacu drainage: a wild, sparsely populated Amazonian forests. During the rain season, the large areas of forests are flooded. This place is known by great biodiversity, which include 1500 species of plants and 207 fish species. There are plenty of smaller rivers, streams, creeks and brooks flowing into Rio Ampiyacu, and in my work I am trying to recreate one of them. 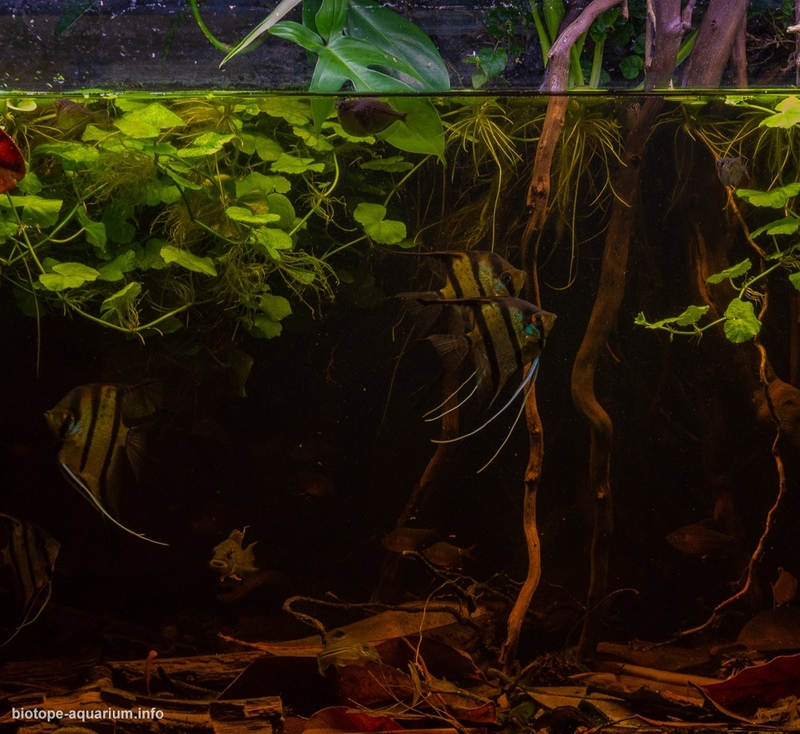 Description of the underwater landscape of the biotope: As can be seen even from the satellite photos, Ampiyacu is a blackwater river – and same is correct to the number of it’s affluents. Because of the forest on the river banks, the sandy bottom is covered with fallen leaves, branches and driftwood. Some trees, growing just near the water, are forming a bunches of aerial roots, which are dangling into the water. These bunches are the place where the angelfishes, apistogrammas and some other fishes tend to gather, take the shelter and spawn. The most plants growing in the water body is the flowing plants, like Pistia, Limnobium, Hydrocotyle etc. During dry season, water level decreases, the water surface significantly decreases and the floating plants accumulate in the riverbed, forming a thick layer called “floating meadows” and shading water (so, the bottom plants are not abundant in these places). Opposite, in wet season water depth and flow increases, and the streams flood the surrounding terrain, distributing the flowing plants over a large area. Description of the parameters of the habitat: Water is generally tea-colored due to tannin staining, but the color can vary depending on the season. The water is relatively harder and tannins level is higher during the dry season; in rain season water becomes softer and tannins level decreases because of the rain water intake. The measured water parameters in one of the creeks in Ampiyacu drainage, at the end of dry season, were: pH was 4.8, conductivity was 26 μS/cm, the temperature was 28°C. 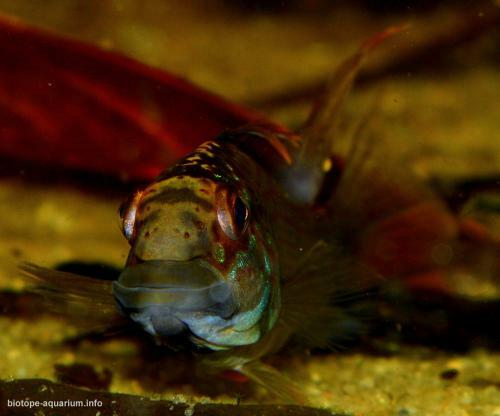 List of fishes and invertebrates occurring in the nature biotope: Apistogramma barlowi, Apistogramma agassizii, Apistogramma ortegai, Mesonauta mirificus, Pterophyllum cf. scalare, Cichlasoma amazonarum, Crenicichla proteus, Pyrrhulina cf. brevis, Nannostomus eques, Nannostomus marginatus, Gasteropelecus sternicla, Carnegiella strigata, Chilodus punctatus, Hyphessobrycon bentosi, Hyphessobrycon erythrostigma, Paracheirodon innesi, Crenuchus spirulus, Hoplias malabaricus, Anablepsoides peruanus, Gymnotus carapo, Eigenmannia virescens, Potamorrhaphis guianensis, Ancistrus hoplogenys, Hemiloricaria lanceolata, Hemiodontichthys acipenserinus, Otocinclus macrospilus, Tatia intermedia, Agamyxis pectinifrons, Bunocephalus coracoideus, Macrobrachium amazonicum, Macrobrachium brasiliense, Palaemonetes ivonicus, Euryrhynchus amazoniensis. List of plants found in the nature biotope: Water: Pistia stratiotes, Limnobium laevigatum, Eichhornia crassipes, Salvinia molesta, Azolla cristata, Lemna minor, Hydrocotyle leucocephala, Echinodorus grisebachii, Helanthium tenellum, Helanthium bolivianum, and plenty of riparian plant species. the Regional Conservation Area was organized in upper Ampiyacu basin.